Do you love your soul-mate beyond your ego? 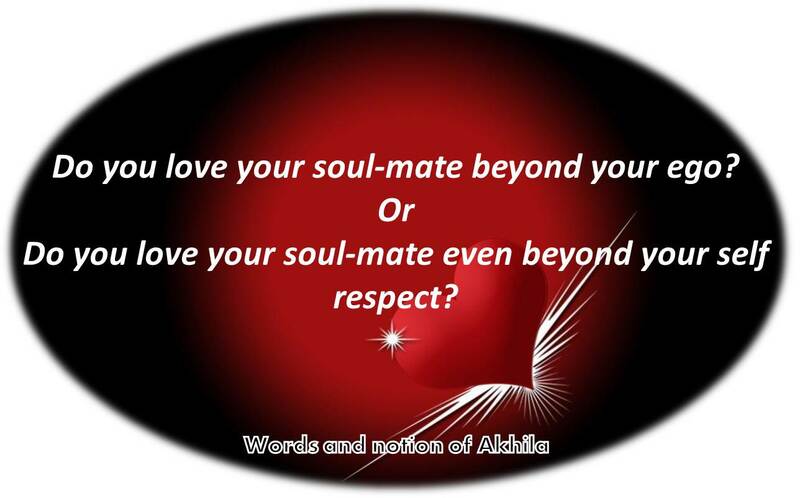 Do you love your soul-mate even beyond your self respect? Nope… Not lost in love… There are 17 soulmate for each… Read my last post…. I found some and lost the contact where they are I know not…. Beyond Ego – Yes, Beyond Self respect – No….. Because I believe you can’t love & respect yourself enough then how can you do the same to someone else? ego is the biggest obstacle in friendship or any relationship however a bond is more important than ego. yes Tanya, true it is.. a bond is more important than ego..
yes.. you are right Daisy….and he is the best partner.. Beyond ego and self-respect coz that’s what Indian women are..
yes.. true..that’s Indian women.. but is it right….? are they paying justice to themselves..? A proud women can never lose her self respect at any cost.. But you know if we don’t sometimes we are termed as stubborn and all goes to parvarish(upbringing) of parents so sometimes we have to go through it as well..
We are gonna bring that, right Awhile..
yes we have to..thumbs up. To me soul mate is one who understands you the best, in and out, better than any one else, so there doesn’t arise any question of ego or self respect between soul mates. These questions definitely can arise between two lovers. well.. that is a new dimension.. I liked your views.. Yes, very much ! Though ego and self respect often overlap, blurring the thin line that divides them…. I love my own soul!! May be as much as I love my own self.. 🙂 or like my own self ..
without knowing the self, without loving the self, one can not care for another.. you are right my friend..
One of those whatsapp forwards .. Wealth, prosperity and love walked in to a house and said choose any one of us, we’ll stay w/ you for ever.. The family huddled together, and decided to choose love.. With love, wealth and prosperity walked in.. Likewise ..
yes.. I agree with you fully.. how can we love some one after losing or own a self esteem.. Sometimes we can’t escape.. Just fall in for them..